in September. Regatta in July. Second Saturday in May, August 15th, October 8th, July 2nd, second Saturday after Oct. 8th. 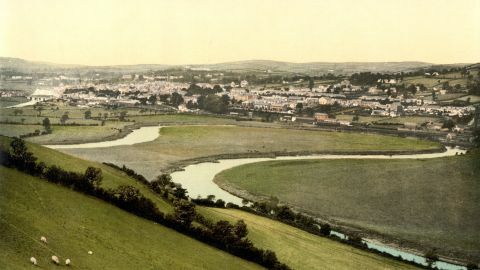 This important seat of the copper trade, is also a parliamentary borough (one member), jointly with Neath, &c., and stands at the head of a fine bay, on the west side of Glamorganshire, 216 miles from London by the Great Western and South Wales Railways, population, 41,606. No copper ore is found in this part of Wales, but coal being abundant, it is brought hither from Cornwall and foreign countries to be fluxed. For this purpose, six-sided calcines, 17 to 19 feet long, and oval furnaces, 11 feet long, are used in the copper works, of which eight are here, on the river Pauley, or by the sea-side; one employing 500 to 600 men. The earliest was established about 1720, after the Cornish tinners began to take notice of copper, which hitherto they had thrown away. The ore or shift goes through various processes, such as calcining and melting, calcining the coarse metal, which leaves about one-third copper; then melting this to fine metal leaving three-fifths or more than half copper; calcining the fine metal; melting the same to pigs of coarse copper, which gives nine-tenths pure metal; and lastly, roasting for blistered copper and refining it into cakes for use, which are 18 inches by 12. In this way a yearly average of 20,000 tons of copper are smelted here, from the ore brought not only from Cornwall, but from America and Australia, valued at about one and a half million sterling. Swansea being at the mouth of the Tawe or Towey, is called Abertawe or Abertowy by the Welsh. By running out two piers into the bay, one being 1,800 feet long, a good harbour has been enclosed, but it is dry at low water; and floating docks are constructed. About 18,000 tons of shipping belong to this port. A castle was built here by the Normans, of which a massive quadrangular tower remains, and presents an object of some beauty. Beneath it is the Post Office a building in the mediæval style, recently erected. A large Market House built in 1830, is 320 feet long. There are three churches, but the only one deserving notice is the parish church of St. Mary, winch was rebuilt in the last century. Some of the numerous chapels are well built. The public Assembly Rooms and Infirmary are handsome edifices. The Royal Institution of South Wales was established in 1835, and contains an important library of works relating to Welsh history, with a museum of coal fossils, antiquities, &c. This was the head quarters of the British Association at their visit in 1854. Besides works for copper smelting, there are others for tin, zinc, pottery &c.; all fostered by the abundance of coal and lime raised in the neighbourhood. Anthracite coal, chiefly for steamers, abounds here, and was used by the whole of the British steam fleet reviewed in the Solent by Her Majesty Queen Victoria, on April 23rd, 1866. Gower, the poet, and Beau Nash were born at Swansea. The river Towey rims up the vale to the Black Mountains at its head, parallel to the canal. Skelly Park is the seat of Sir J. Morris, Bart. Penllergâr, J. Llewellyn, Esq. Several other seats overlook the west side of the bay, and the fine sandy beach, two or three miles long, terminating at Oystermouth, a pretty little bathing place, with an old Norman castle, near the Light or Mumbles Head. Hence the county runs out in a peninsula, much resembling in size, shape, and character, that in the south west of Milford Haven. Gower is the name or Gwyr in Welsh, signifying crooked; it is a mass of rugged limestone, traversed by a red sandstone ridge, which is 584 feet high, at Cefn Bryn, where there is a cromlech called. Arthur’s Stone. At the Conquest it was settled by various Norman knights, and the Flemings and Somersetshire men in their train. 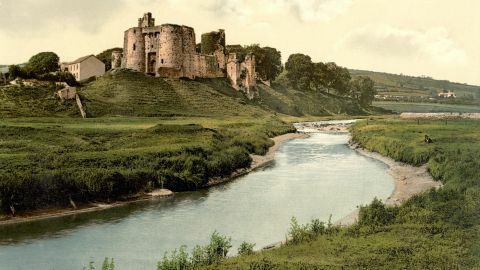 Round the castles they built at Swansea, Penrice, Ruich, Rhosili, and Loughor, their descendants are distinct from the aborigines to this day. There are similar colonies in the county of Wexford. The poet Gower’s family were natives of this part. Druid stones, old castles, and encampments, frequently occur in this country. The cliffs and caves along the coast deserve attention; while the Worm’s Head, at the west extremity, near Rhosili Bay, is a scene of awful grandeur in bad weather. It is so called from the shape of the cliffs which ran out three quarters of a mile long, dipping and rising like a great sea serpent (or worm). Under the very extremity, which is 200 or 300 feet high, there is a vast funnel cave. The scenery of Swansea Bay is so beautiful that it is universally styled by both natives and tourists, “The Bay of Naples in miniature.” Aberafon or Port Talbot, a bustling mining town, near which is Margam Abbey, the seat of C. R. M. Talbot, Esq., M.P., beautifully wooded, and remarkable for its orangery and gardens. There are remains of an abbey of the 12th century. Further on are Ogmore and Dunraven Castles, &c.